Retail Management Hero - Implementation by New West Technologies, Inc.
RMH CENTRAL IS NOW AVAILABLE! Upgrade from RMS; the transition is easy! If you are already using Microsoft Dynamics Retail Management System (RMS) and you’re looking to upgrade your current solution, we can help! With Retail Management Hero, the transition is seamless. Based on the highly successful RMS system, Retail Management Hero keeps data and existing hardware so your current system can be easily upgraded. Retail Management Hero is a complete point of sale solution that enables retailers to efficiently manage all point of sale and back office activities. 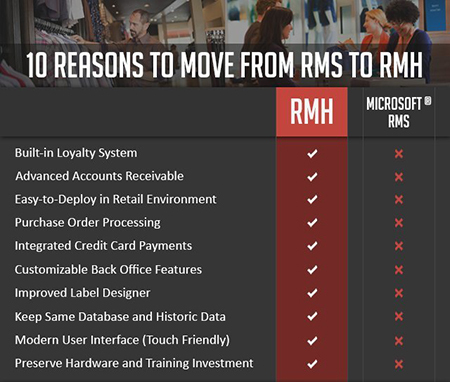 Packed with functionality to optimize inventory management and remove the guesswork from purchasing decisions, RMH is a standalone software system that helps small to medium-sized store chains improve business intelligence while operating smarter and faster throughout the entire retail environment. RMH addresses the needs of businesses in many verticals within the retail sector, including convenience, apparel, sporting goods, wine and spirits, gift and specialty. The software offers fully customizable, intuitive graphical user interfaces with touch screen optimization. Included are a variety of different wizards to automate everyday repetitive tasks as well as built-in receipt, label and report designer for customization and consistent store branding. Advanced POS functions include serialized items, ad-hoc line item, charges, input by weight, layaways, quotes, and work orders. Back office functions, customer Omni-channel loyalty and promotions, and ecommerce integration options are just a part of the many features RMH encompasses. This point-of-sale solution understands retail — and was designed 100% with that in mind. Its intuitive graphical user interface is touchscreen optimized and lets any retailer quickly do everything from looking up inventory and entering items, to processing sales transactions and generating receipts. With powerful reporting built into RMH, keeping an eye on your daily store reports is as easy as 1, 2, 3. Identify at a glance your moving inventory, real-time sales data and customer transactions, which will help you make informed business decisions. You also have the ability to create and customize your own reports! Built to allow for a multitude of third-party add on integrations and application services, RMH enables you to easily add functionality to make it a perfect fit for your business — now and in the future. RMH comes built with payment processing options out of the box. Through RMH’s integration to payment gateways and processors, your customers have the flexibility to work with the processor of this choice. Key features include EMV, Gift Card, EBT, Cashback and more. Are you a current Microsoft Dynamics RMS partner or user? Good news! The RMH solution includes what you appreciate about RMS…and a lot more. Learn more about the benefits of switching from RMS to RMH — without having to recreate your data! Contact us today for more information about how we can help you implement Retail Management Hero as a fresh new system installation or an upgrade from Microsoft RMS and together we can take your company forward into the future!